Japan has already suffered one earthquake in 2012. But the New Year’s Day rumble caused little damage because it was centered deep below the surface. A new study warns, however, that the Tokyo region has a 70 percent chance of experiencing a major earthquake within four years. (Photo: Reuters / Kyodo) On March 11, a tsunami triggered by a massive earthquake resulted in widespread damage in Japan's Fukushima prefecture and destroyed a nuclear power plant. Vehicles, ships, buildings were washed away by the giant flood that resulted from the 8.9 magnitude quake. A new study suggests the Tokyo region of Japan could suffer another major earthquake within four years. Seismologists at the University of Tokyo said the study was based on an increase in earthquake activity in the region following the devastating March 11 earthquake and tsunami that killed almost 20,000 and led to a nuclear disaster. Working at the university’s earthquake research institute, the seismologists said the number of earthquakes in the region is rising — to 343 of 3.0 magnitude or higher in the past six months versus 47 the previous six months. The seismologists believe that the probability of bigger earthquakes increases proportionately with smaller earthquakes. Therefore, the team has calculated a 98 percent chance of a 6.7 to 7.2 magnitude earthquake for the Tokyo region in the 30 years and a 70 percent chance over the next four years. “When we ask when a probability of such a quake reaches 70%, then we get a 70% chance over the next four years,” said Shinichi Sakai, a seismologist on the team, according to The Associated Press. The region was hit with a 6.8-magnitude earthquake on New Year’s Day 2012, according to the U.S. Geological Survey. The USGS said the earthquake struck 495 kilometers (307 miles) south-southwest of Tokyo at a depth of 348.5 kilometers (216.6 miles). Because the jolt was so deep, it was less likely to cause damage at the surface than quake last March 11, which caused a tsunami and, ultimately, a nuclear crisis in the country. However, there were no reports of damage and the Pacific Tsunami Warning Center did not issue a tsunami warning. Initially, the USGS assigned the earthquake a preliminary magnitude of 7.0. It was soon downgraded to 6.8, however. 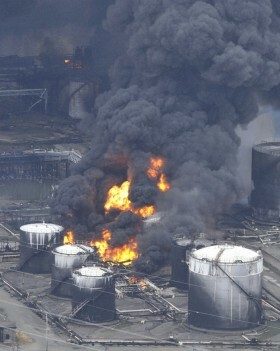 Also the Fukushima Daiichi nuclear power plant which was heavily damaged in the March 11 earthquake reported no damage. Japan is in a area known as the Pacific’s “ring of fire,” according to CNN — “an area of high seismic and volcanic activity stretching from New Zealand in the South Pacific up through Japan, across to Alaska, and down the west coasts of North and South America.” The region produces 20 percent of the world’s earthquakes measuring 6 or higher in magnitude. Thank you very much for this great information. Let’s pray for the people who were struck by this massive quake. God be with us all.